Most of my recent simulated artwork is created inside Daz3d, three dimensional scene composition and rendering software with over 3 million downloads. Although the application is free, Daz monetizes their company by selling digital assets including special characters with accompanying makeup, clothing, hair, props, poses, architecture and environments. I was inspired to make Kesha when Daz3d introduced this character last year, with her dark fantasy armor set. I choreographed and lit this high resolution scene to symbolize Amazonian beauty, strength and courage. Simulation based platforms support more than prefabricated figures and characters. It is a "character engine" on a virtual stage that allows an artist the ability to modify, enhance, blend, mix and morph characters into one's own unique vision. The toolbox in the digital dollhouse is so expansive, the outcome often exceeds the detail from the highest resolution cameras of our time, because the process used in image creation is not optical, and doesn't suffer from the limitations of a lens and light sensitive material. In Kesha, I'm looking for a hyper-realistic characterization of a strong, confident woman, a warrior princess with supernatural powers. Using a large format Epson P20000 inkjet printer, I'm able to represent this portrait on canvas larger than life at 42" by 80". The new Epson inkset promises at least two centuries of archival performance, twice the performance of their previous Ultrachrome ink. Archival stability is a luxury in the digital domain that continues to make significant advances every 4 to 8 years. Emily O’Brien is the star of the Wikihuman project whose mission is "dedicated to the studying, understanding, challenging and sharing knowledge of Digital Humans". O’Brien earned an Emmy Award nomination owing to her performance on “The Young and the Restless”. Her face was scanned in 2008 and again at higher resolution in 2015. Pictured here is the three dimensional wireframe model from her scan in 2015 from the Digital Human League at the University of Southern California. 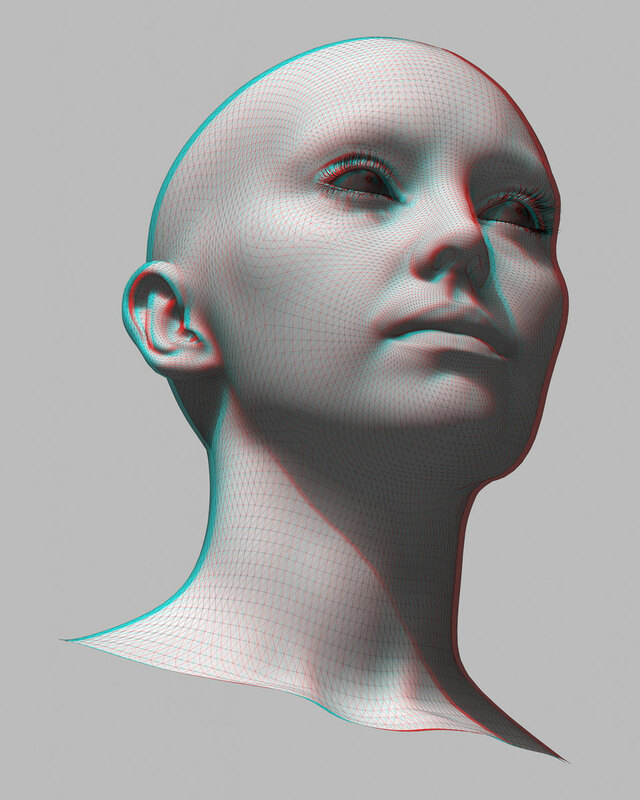 This wireframe 3d stereo anaglyph was rendered with Adobe Photoshop CC. Adobe Photoshop was early to support the render of three dimensional models and is still my first choice for ultra high resolution wireframe rendering. Photoshop allows complete control over line width, color, ambience, hidden line removal, crease threshold, cross sectioning and shading. In addition to extraordinary polygonal mesh control, Photoshop also allows for the creation of stereo anaglyphs automatically rendering color opposites red and cyan for images viewed with colored glasses. Superheroes, pinups and barbarians are a recurring theme in my work. Darwinian attributes of fertility, beauty and strength permeate each character’s identity yet each mythological figure is anonymous. They are powerful symbols of strength but without the baggage of any particular superhero or celebrity. They are the anti-celebrity. These virtual actors are able to survive and procreate on a virtual stage frozen in time, making them immortal, timeless. In the digital dollhouse I build each character, articulate each joint, color and light each scene and render each file to a high resolution inkjet printer with tremendous dynamic range, color fidelity and centuries of archival stability. Again, the printed art object is larger than life at 54" by 80" making an immersive experience for the viewer. Photoshop CC was employed to add the green glowing element to the scene and to color manage the master file for print. Every digital file undergoes a transformation in Photoshop, if only to nuance the brightness, contrast and color balance of the final. Every part of a character’s anatomy is nuanced into shape using interactive tools in the computer. The width of the calf relative to the length of the lower leg, the angle of the ankle in relation to the ground plane, each joint is moved into place like an electronic marionette. One of the most difficult challenges in the digital domain is to impart gravity to the figure. In the art of Tai Chi one drops into their center of gravity and paradoxically defies gravity in the movement.